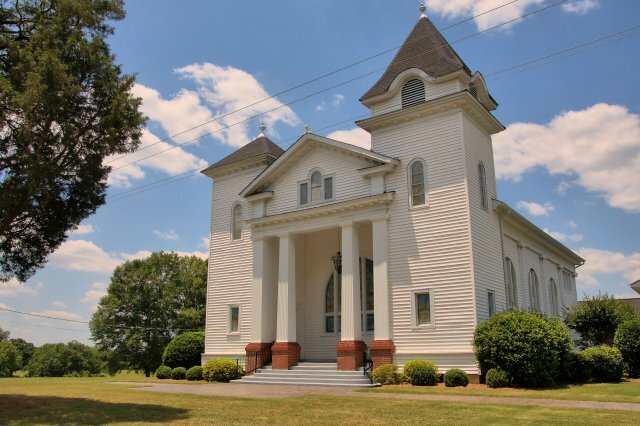 Truly one of the most beautiful churches in the area, Trinity has a rich history in Meriwether County. From the historic marker placed by the United Methodist Church: In 1854, Harmony Church near the Ogletree cemetery, Liberty Church close by the old Campbell place, and Providence Church from the Strickland neighborhood, all came together, after twenty-two years of sharing camp meeting worship, to form Trinity Church, believing that “in union there was strength”. The first church building was constructed in 1854, in what was known as the Stinson community, at the intersection of what are now Harry Hardy Road and Winter Road. Reverend Leonard Rush is thought to be the first pastor appointed by the conference, and Mark Crowder was the first Sunday school superintendent. For fifty-four years, Trinity worship services were held in that sanctuary. That original church building was completely destroyed by a cyclone in April 1908. Services were held in a tent until a new building is completed on the very spot where it stands today; a dedication service was held in 1910. Even though the cost of the new structure was $4,733, that price included a piano and furnishings. Some time between the original formation of Trinity in the building of the current sanctuary, the name of the town had changed from Stinson to Durand. The church’s present sanctuary is located on the site of the antebellum home of Dr. James Winslow Stinson. While digging the foundation for our new addition in 2004, and old, filled in well was discovered. It is possible that, around the turn of the last century, Dr. Stinson drew water from that old well. In 1954, forward thinking church members decided there was a need for an addition to the church. The current parlor, with a kitchen and dining area in the basement underneath, was completed and has been enjoyed since that time. A complete renovation of the sanctuary, including restoring the beautiful woodwork and pews to the original splendor, was completed in 1978. The stained glass windows on the north side of the church were destroyed by a hailstorm on July 23, 1984. New windows, matching the old ones, were created and installed; glass that was salvaged from the broken sanctuary windows was used to make the two smaller windows currently located in the church vestibules. In 2004, one hundred and fifty years after the formation of Trinity United Methodist Church, an increase in membership made a need for more space even more apparent. A new, larger fellowship hall and a more serviceable kitchen were constructed to the north of the sanctuary. This addition was completed in time for the 2004 sesquicentennial celebration under the capable leadership of Board Chairman Jeff Cain, Building Committee Chair Glenn Crowder, and Building Supervisor Henry C. (Penny) Mitcham, Jr.
Trinity United Methodist Church is still going strong. Many descendants of the original church founders and many new Trinity families worship here are each Sunday, rooted in a rich heritage of faith in Christ and growing toward a strong future. 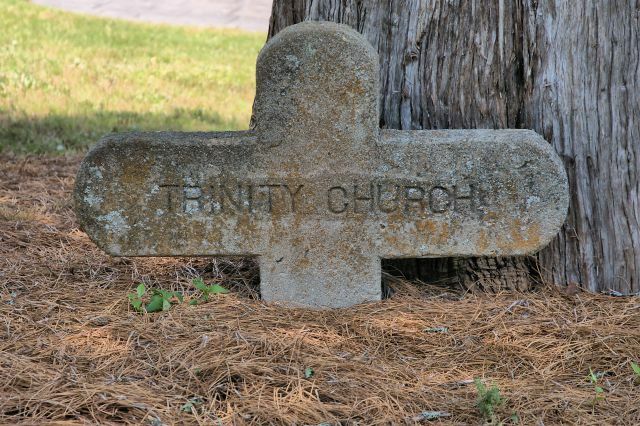 The original highway marker for Trinity is now resting safely beside one of the ancient cedars in front of the church. Visit the church website for more information on services. So happy you finally got to this church. I think it’s one of the most lovely churches that Ive seen in Georgia! Me, too, Gene. Loved it!